Since Earth Day is right around the corner we would like to give you some DIY natural cleaning products that can be used instead of commercial chemical cleaners. Most commercial cleaning products contain dangerous chemicals. This is not only harmful to the environment but also our health. Earth Day comes once a year but living an eco-friendly lifestyle is something that can be practiced on a daily basis. When it comes to making eco-friendly changes it’s the little ones that really add up to make a difference. Simple ingredients from the pantry can be used to make DIY natural cleaning products that are kinder to the environment for a fraction of the cost. These mix-it-yourself cleaners use environmentally friendly ingredients like baking soda and vinegar. 1 to 2 drops or orange essential oil. (This is optional but highly recommended it smells great!). How to use: Combine the ingredients and store in a spray bottle. First, spray the solution on a paper towel or soft cloth, then on the glass. Tip: Avoid cleaning windows on a hot sunny day. This will cause the solution to dry too quickly and leave lots of steaks. All-Purpose Cleaner and Deodorizer – Great for the kitchen counter, appliances, and inside the refrigerator. How to use: Pour the solution on a clean sponge and wipe surface. Brass Cleaner – Great for non-lacquered cabinet pulls, bathroom hardware, and other household brass. How to use: dampen a sponge or cloth with the vinegar or lemon juice. Then sprinkle salt. Lightly rub the surface of the brass. Rinse thoroughly with water, then immediately dry with a clean soft cloth. 1/ 2 cup sudsy ammonia mixed with enough water to fill a one-gallon container. Sudsy ammonia is ammonia with detergent in it. It helps remove tough grime and grease. How to use: Dip sponge or cleaning cloth into the solution and wipe over the surface. Then rinse the area with clean water. Safety tip: Never combine ammonia-based cleaners with chlorine bleach or products containing bleach, like powdered dishwashing detergent. The fumes are extremely dangerous. Before doing any mixing read the product labels. DYI natural cleaning products are better for the environment, you and your family’s health as well as your budget. Most of the ingredients for the DIY natural cleaning products are in your home already and are much cheaper than commercial cleaning products. 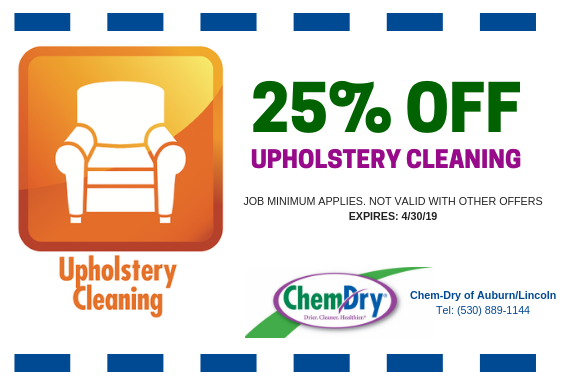 Chem-Dry of Auburn/Lincoln carpet cleaning service offers a deep eco-friendly carpet and upholstery cleaning service. 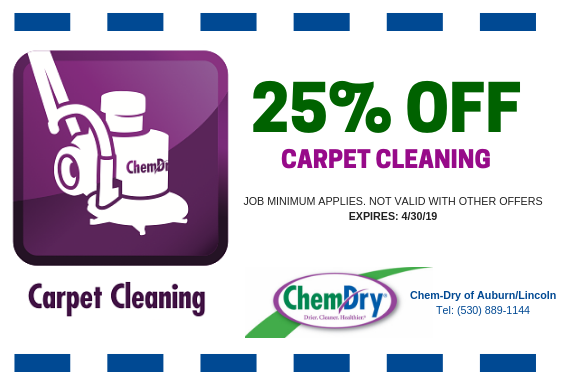 Our carpet cleaning services are provided in Auburn and Lincoln, CA. 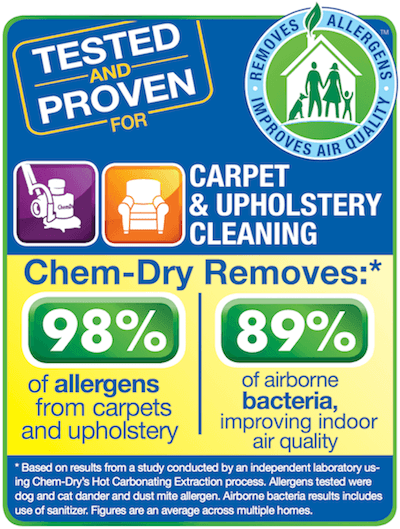 We only use green-certified solutions and proven methods to remove unseen dirt, chemical residue and toxins from carpet. Other carpet cleaning services will use soap to clean carpets. The soap that is sprayed onto the surface will then attracted dirt and contaminants if left behind in the carpet. Steam cleaning technicians will attempt to rinse out the soap. Unfortunately, this process requires a lot of water and rarely removes all the water from your carpet. You will be left with damp carpet for days and eventually mold and mildew growth. 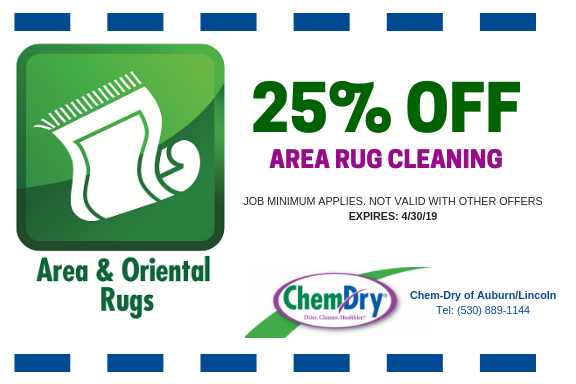 Chem-Dry of Auburn/Lincoln, CA carpet cleaning does not use soap or toxic chemicals. Since we do not use soap there is no need to rinse with so much water. Instead, Chem-Dry of Auburn/Lincoln uses 100% non-toxic, natural cleaning process. Our technicians use the power of carbonation in the form of the Natural, a green-certified cleaning solution. For more information, call us at (530) 889-1144.